PACK EXPO is an important event for Dorner because packaging is one of our biggest industries. It gives us the opportunity to introduce new customers to Dorner and show existing customers our newest technologies. Because of PACK EXPO’s size, Dorner has the chance to reach thousands of packaging professionals all at one event. Visitors can expect to see a broad range of Dorner’s conveyor solutions for packaging lines. One of the conveyors in action at PACK EXPO is the 3200 Series Precision Move, a conveyor that uses a servo motor, timing belt and the latest advancements in drive technology for applications involving extremely accurate movement of product at specific times, distances and intervals. Also on display will be Dorner’s 2200 Series conveyor which is designed for small- to medium-size part handing for a variety of packaging, automation and manufacturing industries. The low profile design allows the 2200 series to easily integrate with robots, works and other machinery. Another display features six Dorner conveyors, including two SmartFlex conveyors outfitted with FlexMove® Technology, that twist to help flip product 90°. This display also includes a 2200 Series nose-over squeeze pacing conveyor featuring a FlexMove common mount; a 3200 Series bottomless squeezing conveyor; and two 3200 Series conveyors with Activated Roller Belt™ (ARB™) Technology, which is a patent-protected technology of Intralox. Our new sanitary conveyor display will feature products such as the AquaPruf® VBT, our vertical belt conveyor designed to move bulk product in straight up 90° applications and the AquaGard® Series, designed for moving packaged goods in applications that call for light cleanings throughout a production run. This year we will be introducing our new SmartFlex® Helix Conveyor, featuring a proprietary flexible chain manufactured by FlexMove. The SmartFlex Helix can operate in a footprint as small as a 10’ x 10’, and is ideal for product handling applications where product needs to travel up or down in a confined space. The conveyor’s compact design allows for five feet of elevation change in 10 feet (incline angle of up to 12°), giving users more freedom and flexibility in designing a material handling system with multiple layouts using a single conveyor. The SmartFlex Helix comes in three belt widths: 85 mm, 180 mm, and 260 mm. Additionally, the SmartFlex Helix does not require any lubrication, providing a cleaner environment and reduced risk of contamination. I am most interested to see the new technologies in the packaging industry. I also like to see how other exhibitors are incorporating Dorner’s conveyors into their displays. 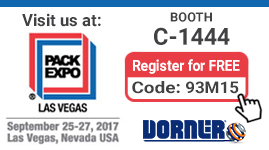 Dorner will be participating in the Amazing Packaging Race at PACK EXPO. During this event, packaging students from colleges and universities across the US earn points for completing engineering challenges while learning about new technologies and interacting with exhibitors. Dorner will also be participating in the NextGEN Networking Fair, an event that “provides employers in the processing and packaging industry, the opportunity to meet and connect with a targeted audience of talented students from packaging, processing, materials, package design and mechatronics programs”. When booking a booth at a tradeshow such as PACK EXPO, we are looking to interact with people in the packaging industry and demonstrate our product capabilities. Tradeshows are a good opportunity to speak with customers and figure out their needs and how we can better serve them. These shows also allow us to see firsthand the current trends and newest innovations in the industry.